The false leaflet of "one-day tour"
Sanya police arrested 10 people violated of spreading false advertising of “one-day tour” for 10-day detention. In order to strengthen the supervision on Sanya tourist market, the Sanya police launched a crackdown on false and misleading advertising of “one-day tour” around Haiyue Square, Pedestrian Street, Duty-free Store and Dadonghai Square from 26th to 29th January. 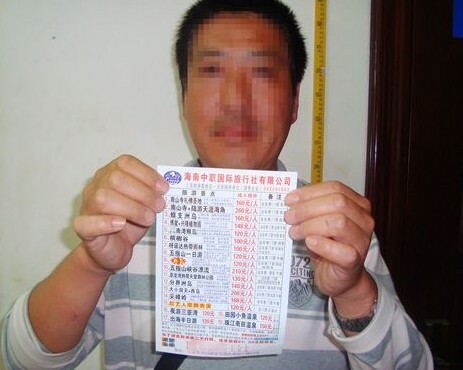 In the crackdown, they seized more than 1,000 false travel advertising leaflets and arrested 10 people. The police warn tourists to Sanya to beware of the “one-day tour” leaflets from streets, and tourists should choose travel agencies with business certificate.